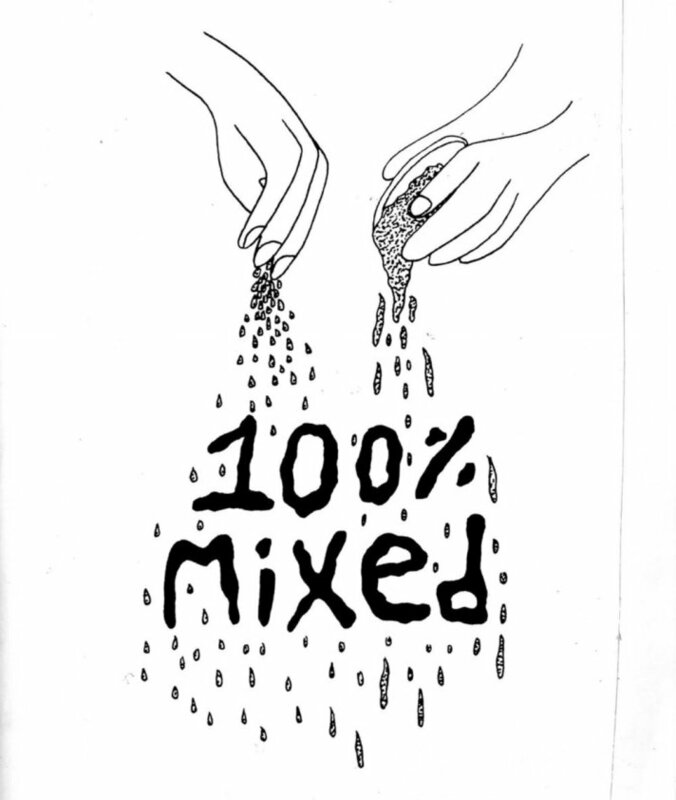 Jess Wu-O and Monika Skelton are the creators of their most recent zine 100% Mixed, a project working to voice the seldom heard narratives of mixed race Asians through peer interviews and community contributions. Monika: We met through a mutual friend. She had seen Jess’s work online and told me about this person who was making a zine about mixed race identity. I think they orchestrated a meeting and then we met at a café. Jess: And for the past three years I had seen Monika at Green Apple Books because she used to work there. After we met maybe a month or two later I was telling Monika about my idea for the zine and she was like “I’m down” and our friendship grew from there. What makes San Francisco/Bay Area a unique or good environment for artists? Monika: Well I grew up in the East Bay and have been hanging out in SF since I was a teenager. I guess SF is like the hub of the Bay Area and I feel like it has this long history of weirdos living here. So I guess with weirdos comes art. So it’s the people that are inspiration for other artists? Jess: Yeah, and maybe political movements? I’m assuming. I just moved to the Bay Area 3 years ago so what I know is from what I have experienced in those last years. The art scene that I have been a part of has been more DIY art or zines and I feel like there is a very big community for that. I think the diversity in the Bay Area is what affects the art and storytelling. "I think the diversity in the Bay Area is what affects the art and storytelling"
What was the inspiration for 100% Mixed? 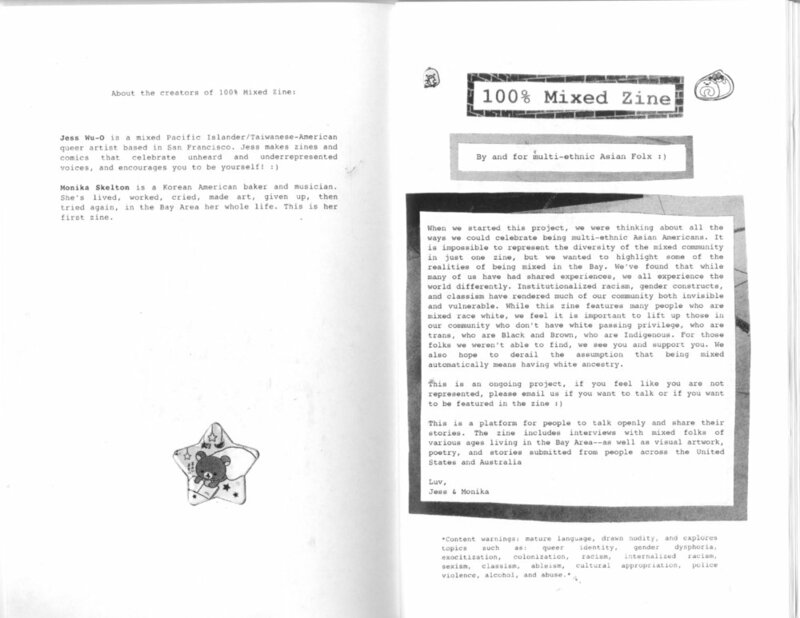 Jess: I made a zine a year before this one with a friend and it was about our experiences being mixed race, queer, and gender non-conforming. So after that I kinda wanted to do it again but have submissions or be about other people beside myself because there’s probably a huge community out there. So after Monika said she was down we started looking for people to interview. Monika: There’s a book [100% Happa]. Jess: Right and that book inspired me, but I wanted to focus on mixed race experiences away from just physical features. Monika: And I feel like the zine changed throughout the process. Even though the photo book was the inspiration we always found that being mixed we are very exotic looking and hard to peg as far as ethnicity so we thought it would be interesting to have a zine focused around being mixed, but not so much about our looks. Yeah there is a perception that mixed babies are really cute, but what’s not talked about is what it is like to be mixed, for example having two parents that don’t look alike. Jess: I think being mixed, no matter what your ethnicity make up is, you do feel alienated in some ways or feel like you have roots in certain areas of the world, but don’t feel like you are part of those cultures. And those were some common themes that we found. There are a lot of generalizations about being mixed and part of the reason for making the project was to see the diversity in experiences and that there isn’t one way or one look of being mixed. So I’m Chinese-Irish, but people often just point out that I’m mixed which is a broader category and almost a generalization of who I am. Jess: Yeah and a lot of people assume you have to be mixed with white ancestry to be considered mixed or happa. We wanted to address that issue through the zine. Monika: I feel that for me in particular I’m definitely white passing and that mode of being mixed is not necessarily more accepted than others, but when I tell people I’m mixed they just assume that one of my parents is white. Those of us who don’t have white passing privilege and don’t fit in that box of what it means to be mixed race aren’t included in that community automatically. 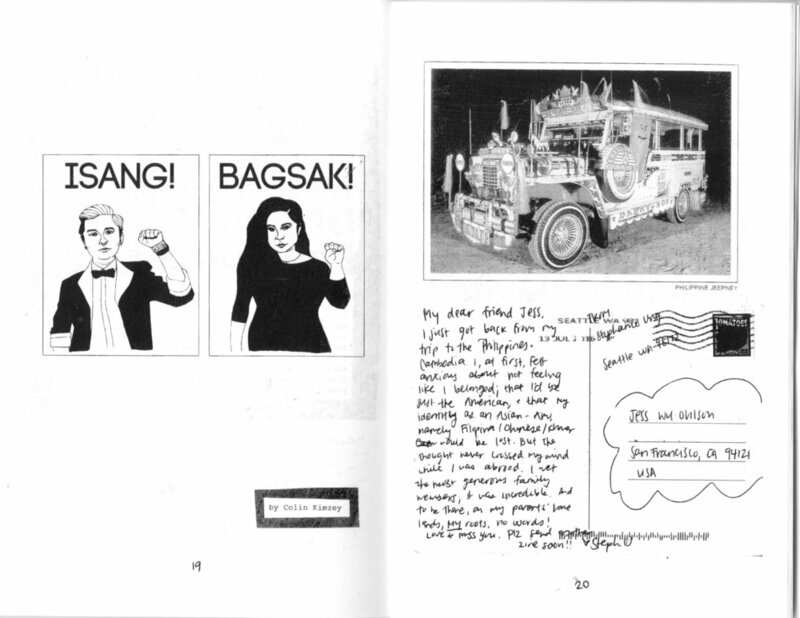 In the zine, interviews seem to be the main driver for discussion and then are supported by other individual contributions such as poetry or drawings. Was that a conscious decision you two made when structuring the zine? Jess: Yeah definitely. 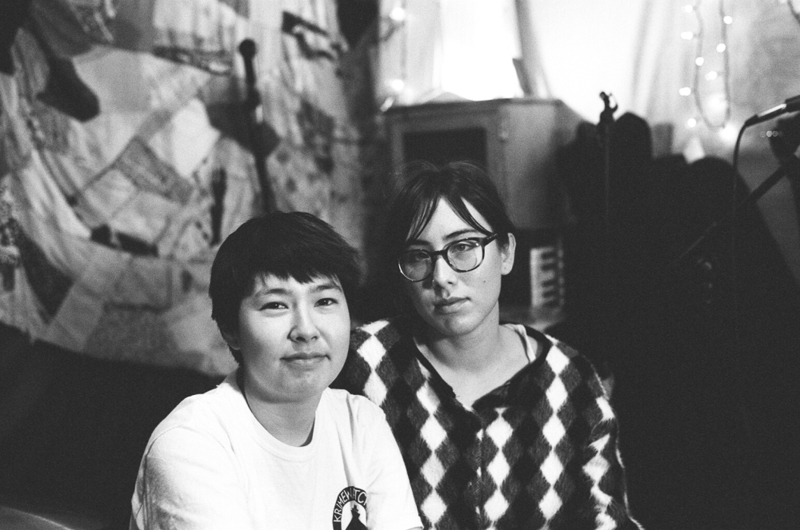 When we first started the project the zine was only going to be interviews and specifically of people living in the Bay Area because we wanted to focus on experiences of mixed people here. Then as we did the project for longer we started to have people become interested in being part of it, but couldn’t interview with us. We ended up opening it up and accepted every submission that was given to us. You interviewed people of all ages for the zine. What was the thinking behind that? Monika: It seemed like doing interviews was a way to get that inter-generation spectrum that we really wanted for the zine. We put up flyers in coffee shops and on the street so that way we could find people not on Instagram or who couldn’t see our stuff. Jess: Yeah that was very intentional. I feel that a lot of people that submit to zines are in their 20’s, 30’s, or 40’s because zines are kind of a niche community. We wanted to reach out to people outside of that community and plus it was really fun interviewing little kids. Do you feel that you have a responsibility towards future generations of mixed kids and do you think they will share the same experiences that you did growing up? Monika: That’s hard to answer. I think the narrative will always be changing. So I wouldn’t think mixed kids in a generation or two would have the same experiences at all because who knows what the world will be like then. I would just hope that with the onset of more and more mixed folks our politics and discourse on mixed race will become more intersectional. Jess: I also feel like even within generations a lot of mixed people have vastly different experiences. So it would be hard to assume that they would have a different experience because it’s different for everyone. I mean colonization plays a big role in why there are mixed people. Monika: Which is why I think that you find so many mixed race White and Asian people. It’s because of the lengths that White western nations have colonized Asia. Jess: I think that will still affect people in the future, whether they’re mixed kids born from mixed parents it will still be passed through. But who knows? A lot of attention has been given to the misrepresentation of Asians in media, in particular Hollywood. Do you feel that mixed Asians share that narrative or are their some advantages to being mixed, like being White passing? Monika: I don’t know. First I would say that it is kind of sad that being white passing would be considered an advantage. I think that in general phenotype for mixed kids tends to be a big thing. You often get treated like you look, for example if you are mixed race Black and Japanese, but look more Black you will probably get treated like a Black person in the United States. The most recent Miss Japan was mixed half-Black half-Japanese right? Monika: Yeah and the media tried to portray it as this great triumph, but in actuality Japanese in Japan had a big backlash to that. People were saying horrible racist things about her from what I was reading. I think there is a lot of anti-Black sentiment in Asian communities and that’s everywhere not just in America. I think that work definitely needs to be done to address that. In one of your interviews for the zine you asked a person about being connected to their Asian culture and they said, “it’s inherently part of being half.” Being judged by two cultures is not a common experience for some people, so how would you describe it? Monika: I feel like I can only answer this question for myself. I didn’t really realize I was mixed until college. It never really occurred to me that I came from two distinct cultures and I think that is because my mom who is Korean never talked about race with me. I had a few experiences when I was much younger where a few of my friends pointed out they couldn’t understand my mom because she had an accent and I remember that being very confusing to me. I didn’t know she had an accent because she was just my mom. Now, growing up and being aware of my mixed heritage I see that there are a lot of differences. Definitely as a woman I see standards of beauty, especially White standards of beauty being held up to me. Do you feel like you act differently around your White extended family vs. Asian extended family? Jess: I definitely feel that I act differently. I grew up in Taiwan and did everything like a Taiwanese kid, like I went to public school and spoke Mandarin ninety percent of the time. Then when I got older my parents switched me into an American school and my experiences with my Taiwanese family dramatically shifted when that happened. I wasn’t speaking as much Mandarin and my ability to express myself went away. So I feel like I can’t completely be myself with them anymore because I can’t verbalize my experiences or have an intellectual conversation with them. Because I lack the vocabulary its almost like I’ve always just been a 5th grader with them. My dad is from Hawaii and his family is all White, but I do have some cousins who are mixed. Its kind of nice spending time with them because then I don’t feel super out of place and when we visit them in Hawaii everyone is mixed or there are a lot of Asians. So in a way I feel more comfortable in Hawaii because people wouldn’t stare at me, whereas in Taiwan they would. How long have you [Jess] been drawing and what made you want to be an artist? Jess: Well my mom is an artist so I’ve been really lucky in that art has always been a part of life. I was lucky that the middle school and high school that I went to had a pretty good art program so many materials were available to me. In college I focused on ceramics and woodworking mostly and I would always doodle. Since I left school I haven’t had the resources really to do those kind of things so that’s when I started drawing and doing zines. Making zines is really fun too and I’ve met a lot of cool people through that since I moved to San Francisco. "In college I focused on ceramics and woodworking mostly and I would always doodle. Since I left school I haven’t had the resources really to do those kind of things so that’s when I started drawing and doing zines." So there is a re-issue of 100% Mixed coming right? Monika: Yeah, we had one of the contributors to the original zine be upset about the outcome of our zine because there was a lot of contributors who were mixed White/Asian and not a lot of other mixed people. It got us thinking about the privileged space we occupy being mixed-White and what modes of communication did we use to search for contributions. Were those modes of communication through White spaces that wouldn’t have reached as many people as we want? Jess: So we decided to edit the zine and change its introduction to better represent people who don’t have white passing privilege and to emphasize it’s an ongoing project. It’s impossible to represent everyone in the mixed community because in a way it’s endless. Also it’s ok to hear criticism and to edit things too. So what’s the next project? Jess: The next zine we are working on is specifically a submissions zine for queer and trans people of color who are mixed with Asian heritage. So it will be issue three under the Mixed zine umbrella and we may end up doing interviews because I had so much fun doing those with Monika.